Outgoing Mercedes boss Ross Brawn says Formula 1's "extreme" 2014 rule changes are as big an opportunity as the 1994 and 2009 seasons that his teams dominated. Brawn was part of the Benetton management when F1 eradicated driver aids at the end of 1993. Benetton and Michael Schumacher stole a march over the field that winter and dominated much of '94. In 2009, Brawn's own Brawn GP team was a commanding pacesetter in the first races following a major aerodynamic regulation change, with driver Jenson Button winning the title. 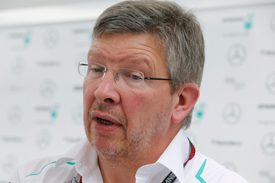 "I think it's going to be a pretty extreme case next year," Brawn told AUTOSPORT. "I've been involved in those situations more than once, 1994 was a good example, 2009 was a good example and I'm sure there are ones in between that don't come to mind!" Although Brawn has now left Mercedes, he believes the work he and his team put in to prepare for 2014 will leave it in excellent shape. "These regulation changes of the magnitude that we have got for '14, they are great opportunities and I hope we are grabbing this opportunity," he said. "We have certainly put enough resource and effort into it. I'm pretty comfortable with the way that we have approached it." The Brawn team's mastery of 2009 was due in part to its predecessor Honda effectively writing off the '08 season to focus on the new rules. Mercedes was one of Red Bull's biggest rivals this year and took a breakthrough second place in the constructors' championship, but Brawn said that did not mean its 2014 preparations were compromised. "I am pretty happy. I think it has been a good balance," he said. "I'm not looking back being worried that we did not put enough resource into 2014. Seeing where the car is now, it is pretty much on schedule. It's achieving most of the targets we wanted to achieve. "We have been working on it for quite a long time. That's one of the advantages of having Geoff [Willis] and Aldo [Costa] on the team. "Geoff started the '14 project, then Aldo picked it up in the middle of this year. Bob [Bell] focused a bit more on the current car to keep that progressing along. "So I don't think we've had to make any heavy compromises in terms of keeping the programmes running well together."